Er. He's seen a lot. So when he came by tonight and told me that he had a soda for me, I was very excited. This had the potential to be Weirdness of the highest order. What strange, dark corners of the world had this man scoured to find this? In what scummed alley, lit dimly by light reflected by windows in towering corporate arcologies, had he haggled with curiously-robed figures for it? What secrets had he been privy to? He produced a can of Pokka Aloe-V. It has an attractive purple and green color scheme on a white background, and claims to be an "aloe vera juice drink with pulp bits". Apparently, this one also includes blueberry juice. That's always good. It is also, according to the icons rinted there, ISO 9001 compliant. It's good to know this soda has some standards. Based on the label, this seems to fall under the "bits of gel floating around" soda family (I'm going to have to update the Venn diagram). I've enjoyed those somewhat before, and I have no objection to Aloe. So: sincere thanks to Cryptonaut for his generous donation, and let's quaff this thing. Joining us for this review are DigDoug, Cryptonaut, and Gointotrance. Color: Very pale purple-orange, almost transparent, with transparent flakes of something, presumably aloe. Possibly dinosaur scales. With the slight ridges, they look like shavings of thumb epidermis. Gointotrance: "I'm going with adult, full-grown Sea Monkeys." Cryptonaut: "Small jellyfish impaled with cedar slivers. Jellyfish in a sandstorm." Gointotrance: "Oh, they've started to float." Cryptonaut: "They've grown spines. They're evolving quickly!" DigDoug: "Looks kind of like the bottom of a spring-thaw pond." Good to know: gel-based sodas are somewhat aversive to many. Scent: Very strong. Sweet, with a moderately strong citrus. The berry is there. Very fragrant, aromatic. GIT: "I've got Bubble Yum and Fresca." Cryptonaut: "Like a gum scent, you're right." Juicy Fruit also gains significant consensus as being similar to this scent. Taste: The texture is very odd. The flakes are thicker than I was expecting. They're not thin; they have substance. Sort of like squishy big grains of rice. Gointotrance: "I'm going to be honest. I didn't let the gelatin shrapnel into my mouth, and I'm not going to. Does that make me a coward?" The taste--leaving the texture aside--is fairly nice. It's surprisingly citrusy, and the blueberry provides a nice, mellow feel. It's very sweet. Gointotrance, after tasting: "I'm diabetic. Should I worry?" DigDoug: "I like it better than the tarragon soda." It's fairly refreshing, but probably overly sweet, and very strange in texture. Based on the number of languages on the can, it must be popular around the world; perhaps the disconnect between gel-appreciating and non-gel-appreciating cultures can be part of future diplomacy. Quaff rating: 3.0. Nice flavor, enjoyable. Cough rating: 1.5. It's hard to get past slimy nodules sliding down your throat. It's a party at the Weird Soda Review Labs! We have a number of guests here tonight, including (I can say with great joy) a horticulturalist friend of mine, who shall be known as DigDoug. Also present are Gointotrance (who has been here before), his partner Purpleatrix, Neighsayer, and Cryptonaut (DigDoug's brother-in-law, a linguist, world traveler, and Web designer). We've been celebrating Nazgul's birthday party with much merriment, and Cryptonaut extremely generously presented the Lab with a Malaysian blueberry-aloe soda which I've never seen before. More on that in the next review. 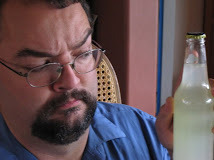 While we have DigDoug here, though, I've been meaning to get his help in reviewing one of the rare group of herb or weed-based sodas. Ben Shaws Dandelion and Burdock is one example, but I was delighted to find another recently. While perusing a local Armenian market, I was delighted to find a bottle of bright green soda labeled "Tarragon". Now, cumin is my very favorite spice. I like cumin in almost anything*. Tarragon isn't in my top ten, except on fish. But--and this is the most important part--as soda flavorings go, it's definitely Weird. How could I pass this up? Where and when: Purchased at the Armenian market. Color: A remarkable, deep emerald green, almost bluish. It's sort of like Green River, but more saturated, if anything. DigDoug: "What's that old time soda? Rock phosphate green." Gointotrance: "It's a green only found in those stretchy Coke bottles from carnivals when you were a kid." Purpleatrix: "It's the color of your pee when you start taking your vitamins. Well, almost." Scent: It has a sweet smell, with a strong bitter/herbal element. DigDoug: "Remember that paste, like the glue-paste in elementary school?" Gointotrance: "To me, it smells like children's cough syrup." That's...odd. It's sweet, but the sweet is accompanied by an odd, heady, musky/herbal/bitter taste. Gointotrance: "It's got a cream soda aftertaste, after a while." It does, a very delayed vanilla taste. Neighsayer:"You know what? I like it." sounding astonished. "Of course, my nose is partially stuffed right now, so I have some level of protection." Cryptonaut: "Tastes like licorice that's been left out in the rain." Gointotrance: "The first taste was kind of that diet cough medicine flavor. Then there was a middle taste, which kind of made me *clears throat* a bit, I didn't enjoy the middle taste at all. Then there was the cream soda aftertaste. Of course, I like licorice left in the rain." Digdoug: "Kind of a rehydrated play-doh flavor. You know, it's got that salty-sweet flavor in there." DigDoug: "Well, it brings back a lot of elementary school memories." Gointotrance: "This seems to be bringing back almost exclusively memories from our childhood." I think I taste a bit of cantaloupe. And yes, I think there's a bit of tarragon. Gointotrance: "Even though it's green, it tastes pink." It's actually pretty good, once you get past the slightly bitter/musky tone. It's pleasant, coolly sweet, and reasonably smooth. Apparently (Cryptonaut is doing some research), this is a Soviet drink which was flavored either with tarragon or woodruff. He has also discovered that woodruff is also known as "wild baby's breath" and "master of the woods". Apparently, woodruff is not convincing to Gointotrance. Gointotrance: "I'm not drinking much more. Tastes like dandruff." Quaff rating: 2.5. I would probably have given it a 3, but the general opinion of the others present is less charitable. Cough rating: 1.5. The herbal taste is very...distinctive. *The main exception was the experimental vanilla-cumin cream cheese. Oh God. There's a gathering at the Lab tonight. Not only are the Kibbitzer-in-Chief's parents (Punctilius and Cilious) here, but my own parents--the Quaffmaster and Quaffmistress Seniors, the ones whose Shasta-buying habits set me on the road to where I am today--are visiting from their secret hideout in Topeka. RoTalMomska and RoTalPopska (suitable for the soda atmosphere) have not exactly volunteered for this review, but the restraints should allow them enough freedom of movement to participate. This one was donated by the Mysterious Stranger. I was very happy to see it; I had feared that the Stranger had abandoned us. Had I not sufficiently expressed my gratitude? I'm not sure how to contact this individual, so all I can do is post, here in this public* place, my sincere thanks. I have a confession to make. I don't like coffee. Well, that's not exactly correct. I love the smell of coffee, and from my very limited experiences with it, I suspect I could develop a taste for it. However, I've observed what coffee has done to some of those close to me. I've observed their quivering husks, more or less undead, incapable of coherent speech or coordinated movement until they receive their morning coffee dosage. I won't go down that road! Compared to some of what we've dealt with here, coffee soda should be positively ambrosial. However, my own ability to assess its coffee-ness will be limited. Fortunately, most of our other visitors are coffee consumers. Cilious, in particular, has had much to say on the proper making of coffee. Thus, we are fortunate that they are here to properly review this Weirdness. Color: Very dark brown, almost opaque. Fizzy. Like unto a misty fen. Scent: The coffee-ish smell is there, underlaid with a faint sweetness. There's a third smell, too, which comes just after the coffee. It's bitter and makes my teeth hurt. I'm not sure why. Punctilius: "I'd say coffee on a binge." K-i-C: "I was going to say smells like washing the coffee pot." Taste: The initial taste is quite sweet, fairly tart--almost citrusy. The coffee comes in shortly thereafter. It's bitter, but not unpleasantly so. Actually, it's kind of nice. It's rather a lot like the Abbondio Chinotto, actually, although that had a stronger bitter/sour flavor. This is--to my surprise--quite enjoyable. Punctilius: "*Sparkling* coffee on a binge." Cilious: "Now that I've tasted it, I can smell the coffee. It's not unattractive. I dont think I'd buy it." RTP: "It tastes like my impression of coffee grounds. Cowboy coffee." Cilious: "Cofee was quite a luxury in the old west, wasn't it?" This leads into an extensive discussion of the nature of coffee. Whether cowboys were capable of obtaining coffee, how it would have been made, its impact on cattle drives, burlap, and other such topics are explored. RTM: "It's got the same kind of aftertaste as coffee does." This is spoken with a not-entirely-approving expression. Me "So this is a fairly authentic coffee experience?" This is a crowd which enjoys conversation, and it's been all I could do to keep them focused on soda for as long as I did. The conversation has moved on, and is currently careening past employment experiences involving coffee, relative caffeine intake, and dog adoptions. Eleanor of Aquitaine and the Marshall Plan are likely to come up soon, and so it's probably best to draw a curtain over the quaffing portion of the evening. I do like this family. Quaff rating: 3.0. Surprisingly enjoyable, although not really remarkable, except in as much as it is not awful. Cough rating: 0.5. I don't like coffee. *It's still public even if nobody is there. We at the Lab hope that all of you have had a splendid beginning of 2011. In any case, we're going to attempt to keep up with our review schedule a little more this year. There are several driving forces behind this resolution: first, to Quaff is a deeply enjoyable experience, and exploring Weirdness is my calling. Second, if I don't work through some of the backlog of soda in the Lab vault*, the Kibbitzer-in-Chief will probably start the Weird Soda Reviewer Internal Organ Review**. So today we'll take something I've never seen before. I came across this at a nameless, immemorial southern California store, lurking on a shelf, clustered with others of its kind. It...called to me. I walked back and forth along the endless aisles, moving through the store as if to escape a clinging film of beverage ennui. As my wanderings became more frantic, the names and logos began to reverberate in my brain. Commonplace logos trembled and shivered behind my eyelids, resonating at the frequency of mass marketing. I felt my mind and spirit congealing like cooling bacon grease, losing their effervescence as I began to despair at finding novelty in an increasingly stale world. The sky, leaden and heavy with rain, seemed to mock me. "Water," it shrieked, "only water shall I offer you! Water with no flavor, no texture, water to dissolve the fibers of your interest and quench the flame of your esprit de quaff!" And then a glimmer of gold, like a lost doubloon in a murky sea of hamster burpings. From a distant shelf it whispered, beckoned, summoned. "You've never had me...I know what you seek...come...come to me..."
I found it there, under that sky which promised only the endless deluge of gray and the reflection of headlights on a sodden street. What was this strange cylinder which promised a relief from the monotony, the tedium? What did the three stars on its label portend? Whence its claim of "Premium"? With curiosity, the long-absent sparrow of my psyche, beginning to flutter, I handled the bottle gently. I sought answers, questing for a grain of truth in the bushel of lies and misdirection which was all I had found in the world. Surely, somewhere on this bottle I could find the key to the persistent questions which had kept me awake on all those nights when nothing could soothe me. How anyone could know what endless gulfs I had contemplated, when those hours lay between me and the false solace of sunrise, I would never know. And yet, somehow, I felt as thoug here I might uncover a clue, like the missing Lego from the Beta-1 Command Base I had as a naive child, to lead me to...salvation? No, there would be no salvation for one such as I. But solace, and calmness to face my inevitable end. I turned the bottle carefully. Perhaps there would be a list of ingredients, a catalogue of the components of the mixture (if there can be an enumeration of the elements of tedium, oppression, and release). But there was no label on the back. There would be no ational breakdown, no scientific atomization of this beverage; it wad to be understood holisticlly, in a single experience, or not at all. I, who had spent my years in a futile effort to bring a rational, analytical mind to grips with a universe which seemed determined to confound and confuse such approaches, felt the absence of ingredients as a blow to my very core. Was this bottle conforming the essentially incomprehensibility of the world and the futility of life? As my fingers skidded fruitlessly over the glass of the enclosure, failing to find secure purchase on this increasingly labored symbolic representation of the utter meaninglessness of existence, I also noticed that there were no bottle bumps. Even those cryptically coded signals, linking the cages imprisoning sodas (or perhaps protecting them) to the lace of their creation, were absent. This bottle stood untethered to any reference, a single, solipsistic figure. It had no beginning, no tie to any parent or God. It was, like me, eternally alone. As I gazed at it, my mind weighed the possibilities suggested by this bottle. Did it suggest that each of us, as a separate being with no possible permanent or meaningful connection to past or future, was inherently doomed to an existence without effect? That each of us was a point both fixed and unfixed, with no reference and no way of measuring its progress from here to there, or then to now? The scream built within me, but I pressed it down with habits of self repression gained after an infinity of pre-dawn mornings of horror and loneliness, staring into the ashes of a dead fire in which I had burned love letters I had written to myself to extend the illusion of love and acceptance which was all which separated me from utter annihilation. The bottle bore the words "Est. 1937" like a sigil of doom. Was this soda mocking me, whose relative youth could not allow him to have seen such a fabled year? I, who was born decades after that date, yet who had lived countless millenia of existential grief, I held the bottle in trembling fingers. I would not be mocked by this false carbonated prophet! I raised the bottle over my head, ready to dash it to the floor, shattering it and my dreams of redemption in one blow. "Begone, fiend! Begone, tempter! You shall beguile me NO MORE!" "You have to pay for that." The words, spoken in a simple, unadorned voice, pierced my mind. All of existence froze, the cyclopean millstone of fate which so relentlessly worked to grind the grain of my ambition into the powdery flour of uselessness, to be baked into the bread of futility and spread with the mayonnaise of boredom came to a shuddering halt. It was not the bottle alone which held the truth. The bottle...and the voice. The voice, which transubstantiated the bottle, brought my life--a careening, futile conglomeration of sharp angles and contempt--into sudden perfect alignment. The Rubik's Cube of my spirit, which had never had more than five squares of the same color on any side, suddenly became a cube of unified, brilliant hues, each face a pure, Platonic aspect of emotion and thought. I had to pay for ALL of it. I left the store and bought a puppy. Figure 1: Damnation or salvation. I was so overcome by existential despair and the futility of life that I forgot to take the picture until we had consumed most of the soda. Note the apples of ennui. Where and when: I honestly don't remember. Color: A very hazy clear, much like lemonade. Maybe slightly yellowish, but pretty much whitish and slightly translucent. Scent: Sweet--very sweet. The lemon is tart, but almost syrupy--it smells like lemon bar cookies. Nazgul: "Actually, it smells more like lemon honey." Taste: If you were to make a soda out of Girl Scout Lemon Cooler cookies, it would taste something like this. It's strong on the sweet and creamy part, very sweet. Has a nice coolness, and the lemon is tart but mild. The first thing that comes to mind is store-bought lemon meringue pie, except without the crust or meringue. The cream is a bit vanilla-y, but in the sweet vanilla way (like french vanilla ice cream, rather than vanilla extract). The lemon begins as a cool, slightly tart, quite pleasant lemony flavor on top of the sweetness, then develops a little more tartness. It's still nice. Carbonation is unusually light, which gives it a slightly watery feeling, but I don't mind it. It's actually probably better that way--it's so sweet that it would be too syrupy without it. I like it pretty well, actually, although not quite as much as Nazgul and the LAT, who are commenting on how good it is. LAT: "Lemon cream honey. That's probably why it's called lemon cream. I like it." Imagine a flavor consisting of lemon bar and lemon cooler cookies, add a bit of french vanilla ice cream, and just a dash of lemonade, and you'll be there. Quaff rating: 3.0. A little nicer than average. Quite pleasant. Does not crush the soul under the vast mountainous burden of existence. Cough rating: 1.0. Really a bit too sweet, and the aftertaste (which only now begins to creep up) is sour and a bit bitter. * That being under the bench at the kitchen table, plus a corner of the garage. ** Starting with the spleen.